Spitz Dog Breeds: Spitz-type dogs are characterized by a wolf-like appearance with a high carried puffy tail that curls up and over its back. The German word 'Spitz' translates as "Sharp Point" and refers to the tapering shape of its pointed muzzle, together with their small pointed ears that are characteristic of the breeds. Most of the Spitz dog breeds were developed thousands of years ago in the colder northern parts of Europe, Russia, Asia, and North America. The Spitz dogs all share thick and dense double fur coats and unique, heavily furred paws that enabled them to endure cold temperatures and cross snow and icy terrain. Many of the Spitz-type dog breeds also have a ruff of fur around their necks which acts as insulation around the neck and upper shoulders. The spitz dogs were all working dogs used for hunting, herding, watch and guard dogs, pulling sleds and as family companions. As the Spitz-type dog breed travelled or were to other countries, the dog was given a new name reflecting its new country, such as the Finnish, Japanese and the German Spitz. Spitz Dogs: The "Spitz" is not a breed. It is a name used to describe several dog breeds that share several breeds that share loosely common ancestry, similar physical attributes and characteristics. Spitz-type dogs, also known as the northern or Nordic breeds, have an adaptation to the cardiovascular system (circulatory system) by which the blood vessels in the paws prevent excessive loss of body heat through the feet when in contact with cold ground. As pet dogs, most of the Spitz-type dog breeds are happy living with families, but they are not the easiest of dogs to train. 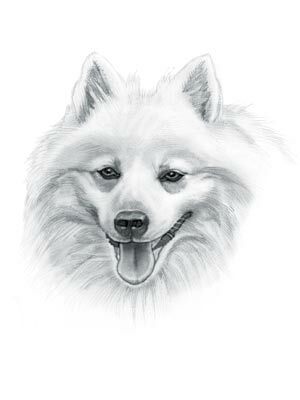 List of Spitz Dogs: The list of Spitz-type Breeds include the Alaskan Husky, Alaskan Klee Kai, Alaskan Malamute, American Eskimo Dog, Canaan Dog, Chow-Chow, Eurasier, Finnish Lapphund, Finnish Spitz, German Spitz, Icelandic Sheepdog, Keeshond, Japanese Spitz, Norwegian Buhund, Norwegian Elkhound, Pomeranian, Samoyed, Schipperke, Shiba Inu, Shikoku and the Siberian Husky. Spitz Dog Breeds - Akita: The large, brave Akita belongs to the Working Group, originated in Japan and was used for droving, pulling, hauling, hunting, herding and guarding. Spitz Dog Breeds - Alaskan Husky: The large Alaskan Husky belongs to the Hybrid / Mix (Siberian Husky and Alaskan Malamute) and used as a Sled Pulling Dog. Spitz Dog Breeds - American Eskimo Dog: The small to medium size, protective American Eskimo Dog was brought to America by German settlers and used as a Watchdog, Performer and Farm dog. Spitz Dog Breeds - Chow-Chow: The medium size, intelligent, ancient Chow-Chow breed has been known in China for over 2000 years. Spitz Dog Breeds - Eurasier: The medium size, reserved Eurasier was developed in Germany and a cross between a Samoyed, German Wolfspitz and a Chow-Chow. Spitz Dog Breeds - Finnish Lapphund: The medium size, brave, keen Finnish Lapphund breed were developed as caribou herders and guard dogs by the Sami people of Lapland. Spitz Dog Breeds - German Spitz: The small (Klein) to medium (Mittel) sized, robust German Spitz was used as a herding dog and once used by the nomadic tribes who roamed the Arctic. Spitz Dog Breeds - Icelandic Sheepdog: The medium size, curious Icelandic Sheepdog was taken to Iceland by early settlers. Spitz Dog Breeds - Keeshond: The medium size, agile Keeshond was developed by Dutch breeders as a Ratter and Barge Watchdog in Holland. Spitz Dog Breeds - Japanese Spitz: The small sized, affectionate, highly vocal Japanese Spitz looks like a miniature version of the Samoyed but there is apparently no definitive connection between the two breeds. Spitz Dog Breeds - Norwegian Buhund: The medium size, eager Norwegian Buhund was bred as a Watch and Farm Dog in Norway. Spitz Dog Breeds - Norwegian Elkhound: The medium size, hardy Norwegian Elkhound was developed in Scandinavia and has existed for hundreds of years in Norway. Spitz Dog Breeds - Norwegian Lundehund: The small sized, athletic Norwegian Lundehund was used as a Watchdog and a Puffin Hunter. Spitz Dog Breeds - Pomeranian: The small sized, active, courageous Pomeranian was developed in Germany where it was referred to as a 'dwarf-spitz'. Spitz Dog Breeds - Samoyed: The medium size, sociable Samoyed was developed by the nomadic Samoyedic people of Siberia. Spitz Dog Breeds - Schipperke: The small sized, watchful Schipperke was developed as a ratter by Flemish dog breeders in Belgium. Spitz Dog Breeds - Shiba Inu: The medium size, self-assured, faithful Shiba Inu was bred in Japan and used as a Watchdog, Flusher and Hunter. Spitz Dog Breeds - Shikoku: The medium to large sized, cautious Shikoku was developed in Japan where it was originally used for boar hunting. Spitz Dog Breeds - Siberian Husky: The medium size, outgoing, observant Siberian Husky was bred in the remote regions of Siberia in Russia and used as a Watchdog and sled pulling dog.